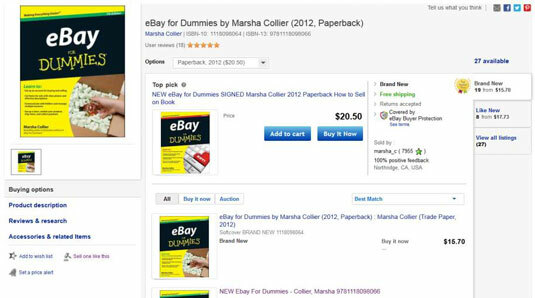 Searching eBay with a product code will bring you to an item-specific eBay catalog page. Items are listed based on their universal SKU (Stock Keeping Unit) number and assigned eBay product ID (EPID). When you see the specific product you are looking for, click the title to be brought to a page containing information about the item, user reviews, and a list of how many of the item are for sale and whether they are auctions or fixed-price listings. A Top Pick will appear at the top; this is the item for sale at the lowest price by an eBay Top Rated Sellers. Best Match is the default search option; it sorts the listings you see by their relevance. A listing’s relevance is based, in part, on past successful buyer behavior for similar items. The added reasoning behind this sort order is to identify sellers who provide great buying experiences and sellers who don’t, all gauged by the use of Detailed Seller Ratings and feedback ratings. Time: ending soonest allows you to view the category listings in time order, with the soonest to end on top. Time: newly listed shows the items that have recently been listed in the category. Time: new today is where you can get the jump on other bargain hunters and see the full listing of items launched within the past 24 hours. Price + Shipping: Lowest first sorting can be deceiving. Many sellers list their items at an extremely low starting price to attract bidders. You may have to wade through 20 pages of 99-cent items before you reach the dollar ones — a huge waste of time. Price: Highest first and Price + Shipping: Highest first are good choices if you’re looking for high-ticket items in a category. Distance: nearest first is used if you want to buy a large item (sofa? refrigerator? car?) and would rather save on shipping or want to drop by to inspect the item, this is the best search for you. You can also search through the category. Type some keywords in the search box to find, for example, a particular book. Because more than 20 million items are up for auction at any given time, finding just one (say, a book on antique Vermont milk cans) is no easy task.